Hurricane Florence made landfall near Wrightsville Beach, NC this past Friday at approximately 7:15 am bringing with it maximum sustained winds near 90 mph. After impacting the coast on Friday morning Florence stalled for nearly a day, causing severe damage on the eastern side of the state. It is estimated that some areas along the coast saw as much as 40 inches of rain. By the time the slow-moving hurricane crawled toward the Charlotte metro area on Saturday it had been downgraded to a tropical storm. Although Florence was no longer categorized as a hurricane, it continued to produce widespread heavy rains and caused flash flooding across the Piedmont. By Monday morning Florence was re-categorized as a tropical depression and continued to move toward the northwest. The storm is now making its way toward the Ohio Valley. Davidson College was lucky in that it was not severely impacted by Florence. Situated north of Charlotte, Davidson saw significant rainfall over the weekend but did not experience flooding like some areas further south. 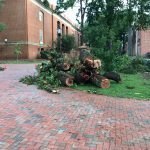 The most obvious damage on campus was caused by fallen trees. A large oak tree fell on Sunday, narrowly avoiding E.H. Little Library, Richardson Stadium, and the E. Craig Wall Jr. Academic Center. 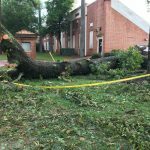 Since the storm caused very little harm on campus classes continued as scheduled today. Thank you to all of those who worked tirelessly over the weekend to ensure that everyone remained safe during the storm—a huge shout out to our Physical Plant Department, Dinning Services, and Campus Police! Archives & Special Collections is especially thankful to those who monitored the Library for leaks and water damage. Since moisture is one of the most harmful threats to archival collections, we are grateful to those who helped us protect our materials. Thank you! 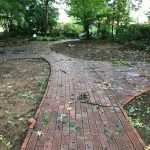 If you are interested in reading about past storms that also impacted Davidson College, please check out an earlier blog post on Hurricane Hugo.